The new South Neighborhood, a 6,350 square foot expansion on the south side of Rocket Mortgage FieldHouse’s main concourse as part of Rocket Mortgage FieldHouse Transformation, is open to welcome fans to eat, drink and enjoy a fun social atmosphere when attending Cavs and Monsters games, concerts and events at The Q. Located just inside the Discount Drug Mart Entrance, the South Neighborhood is the first of what will be several new social gathering hubs, which were key design elements of the renovation project to update and modernize the 25-year-old arena. Rocket Mortgage FieldHouse Transformation will be completed in the fall of 2019. “We have had tremendous success collaborating with popular local restaurateurs and entrepreneurs and are proud to continue working with Chefs Sawyer and Small and all of our culinary partners to further bolster the food and beverage experience at The Q,” said Kevin Kearney, District Manager, Aramark’s Sports & Entertainment division. In addition, Saucy Brew Works, one of Cleveland’s most popular breweries, has partnered with the Cavaliers to create a 1,500 square-foot beverage-only beer garden that brings a trendy vibe and energy to the South Neighborhood. “We are also proud to have our long-time partner Discount Drug Mart as the wayfinding marquee to the South Neighborhood,” added Komoroski. The Discount Drug Mart Entrance located on Gateway Plaza across from Progressive Field serves as a convenient entrance for ticketed fans attending events at Rocket Mortgage FieldHouse and provides easy access to the South Neighborhood. 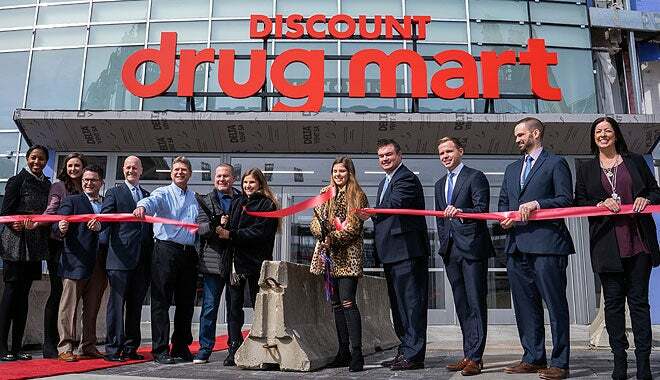 “As the excitement builds around Rocket Mortgage FieldHouse Transformation, and celebrating 50 years in Ohio this year, Discount Drug Mart is thrilled to be a part of the promising future and all the great experiences ahead for all fans and our customers entering the arena,” said Doug Boodjeh, Discount Drug Mart COO. “As the Greenhouse Tavern turns 10 this year, it's so exciting to think of how far we and our city have evolved over the past decade. I’m so proud to consider myself a part of the culinary fabric that makes us Cleveland. We believe public venues have a responsibility to tie to the local community, and no one exemplifies this more than Aramark and The Q. Together, with Aramark and all the other great chefs who are featured at The Q, we have raised the bar on the type of fare that can be found at sports venues. Our latest project - a little slice of east 4th at the Greenhouse Kitchen.” Executive Chef Jonathon Sawyer. “I’m so excited to be a part of the first neighborhood to open to the public in Rocket Mortgage FieldHouse Transformation and thrilled to renew and expand my partnership with Aramark and the Cavs. Jonathon and my dishes complement each other well, and I think anyone could find a great meal from our menu. As a life-long Clevelander and Cavs fan, it brings me great pride to bring my handcrafted sandwiches and specialties to the South Neighborhood.” Executive Chef Karen Small. “It’s an honor to be partnered with such a stellar group that is the Cleveland Cavaliers. We take great care and pride in producing superior quality, creative beers and this beautiful new pub is the perfect place to showcase that passion.” Eric Anderson, Brew Master, Saucy Brew Works. Saucy Brew Works at Rocket Mortgage FieldHouse will have 18 taps and 8 select beers that will rotate with seasonal favorites and feature many of Saucy’s most popular selections. IPA ASAP- American India Pale Ale - crisp, dry and citrusy with a lingering bitterness - 7.0% abv. LOVE YOU, BYE – Hazy Imperial IPA – super juicy and permanently hazy – 8.0% abv. HABITUALE-Kolsch Style Golden Ale - light, clean, crisp with a slight citrusy, spicy character – 5.3% abv. MODERN CRIMES – Toasted Coconut Porter – crazy smooth with just enough coconut – 6.3% abv. WHAT’S HIS NUTS? – Vanilla Stout with Peanut Butter and Coffee – black, rich and smooth – 7.5% abv. ÜBER ASAP- Blood Orange and Vanilla IPA- Beefed up version of IPA ASAP with a ton of Blood Orange puree and a touch of vanilla 7.0% abv. NUGGET SMASH – Single Malt, Single Hop IPA – light-bodied IPA, dank, and brewed with nugget hops – 5.9% abv. DON’T STOP WIT IT WIT IT – Belgian Style White with Tangerine – brewed with coriander and tangerine instead of traditional orange peel – 4.8% abv.